Hyatt Hotels wasted no time and pulled no punches in condemning UNITE-HERE’s seven-day strike against six hotels in San Francisco, Chicago, Los Angeles and Waikiki. “Oh yeah,” responded 15-year Grand Hyatt employee Aurolyn Rush when learning of Hillan’s dismissive remark, “then why are we all here,” as her arms extended proudly to the active picket line outside her hotel. All 700 workers walked off the job on September 8 at the two downtown Hyatt hotels in the “City by the Bay” with the union indicating over 2000 workers participating in the strike nationally. For a few hours on Friday, January 7, San Francisco’s most contentious and longest-running labor dispute recalled scenes straight out of Hollywood, at least that’s how distinguished law professor Jack Getman saw it. The sidewalk picket audience of around 100 laughed and cheered, including Getman’s numerous colleagues from the most prominent law schools in the nation. The Association of American Law Schools (AALS), comprised of around 300 Law Schools, scheduled its annual convention of 3000 delegates at the Hilton, the largest hotel on the west coast with 1908 rooms and three enormously tall towers offering majestic panoramic views of the wondrous San Francisco skyline and bay waters. 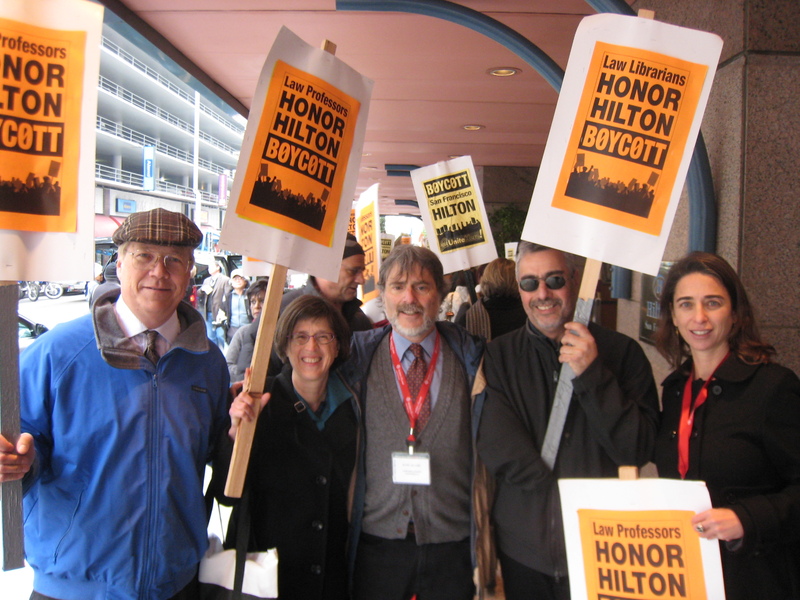 Local 2 member Marc Norton leaves the Hilton restaurant & bar. 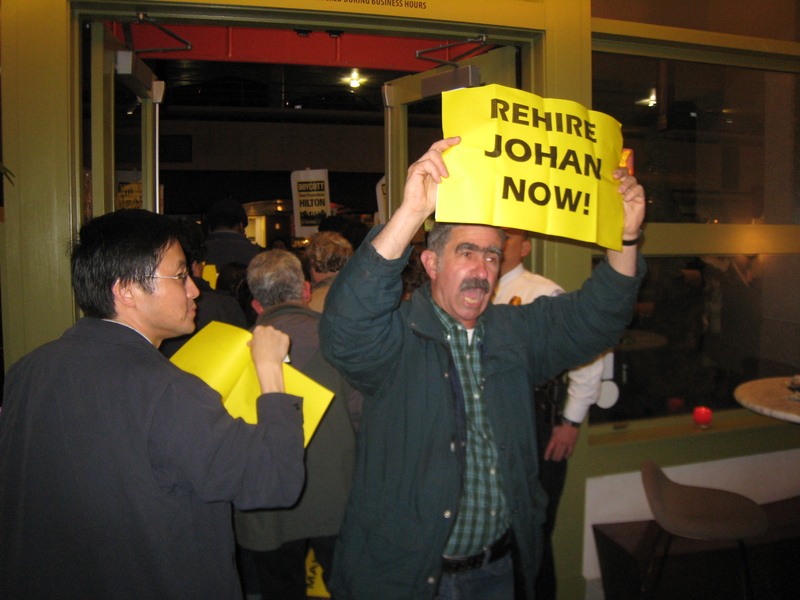 A delegation of around a dozen was protesting the firing of bartender Johan Tahir. Yet, major hotels like the Hilton and Hyatt are still demanding dramatic cuts in health benefits and pensions along with significant increases in work assignments. 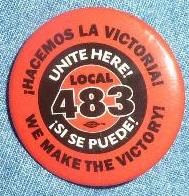 The hotel union, UNITE-HERE, is responding. On December 16, there were protests in San Francisco and Honolulu against the Hilton and a day-long strike against the Palmer House Hilton in Chicago. Meanwhile, management is reciprocating. In San Francisco, for example, they are stepping up their harassment as the contract dispute with 9000 workers at 61 hotels enters its 17th month.